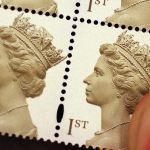 How Much Does a First Class Stamp Cost? As from today it’s 46p in the UK. But does it even matter? The voxpop from the BBC shows a number of people of all ages trying to answer the question and the thing that struck me most was the sight of two young men, who clearly had no idea, guessing at either £4 or £3!!! The simple fact is for this generation it’s a irrelevant cost. They live their lives online and are mobile, texting, emailing and Facebook messaging friends. The thought of popping down to the the post office to post a letter is uttely alien to them. But even the older members of the public quizzed seemed to be miles away when trying to guess the cost. The simple fact is the world has changed irrevocably and that snail mail is becoming a thing of the past other than for delivering the parcels that were originally ordered online. The fact that so many printers are now struggling (or worse) indicates that there is simply not the demand from publishers and mail order companies as there was in the past to publish their content offline. Keep your 46p in your pocket!